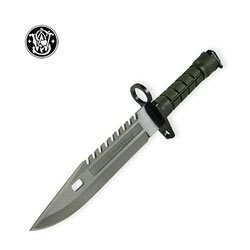 Smith & Wesson's updated version of the Ontario Knife Company M9 Bayonet, the SW3G Special Ops M-9 includes the essential features that survival knives in a technological age should have. Similar to the knives issued to military helicopter pilots in Vietnam, the M9's saw-toothed spine can cut through plexiglass and sheet metal. With blade and scabbard locked, there's a handy wire cutter feature as well. A combo serrated edge parts rigging and slices seat belts with ease, and there's plenty of plain edge left for the usual work. In general, this 12-3/4-inch-long bowie knife with nearly 8 inches of blade is the bayonet Rambo would have carried if he were a real person. Bayonet loop and notch allow mounting to the appropriate military rifles for display or actual use. Ontario Knife Company is a long term supplier of dependable knives for the U.S. military, so the M9 SW3G is the real thing. Since it hasn't been streamlined for civilian use, the 440C high carbon stainless steel is thick enough for pry bar action. Rat tail tang construction and a light but rugged polymer handle save a little weight, but not much. The nylon scabbard in matching OD green includes a map pouch, handy for other essentials as well, and clips to the belt. While this is a little more knife than many backpackers or hunters would want to carry, the M9 is a great knife for those who travel remote tracks in vehicles.